Today marks the third time we’ve launched and soared from the southwest tip of Kaena Point, the very end of the most remote corner of the island! Although I think it's the first time we've hiked in from the Yokohama side. But now that we know how well the ridge works on these westerly and sea breeze days, I think it’s time we find or groom a decent launch up there. The one we’ve been using is abysmal! Just ask the poor suckers who followed me out there today. Conditions in the morning were west-southwest and forecast to stay that way. The only thing we had to watch out for was building thunderstorms sent over from Kauai under an upper trough. I saw early numbers looking due west and not too strong, perfect for Makua, so I headed out. There was talk of Diamond Head, Koko Head, Motocross, and even Makapuu, but I’m not sure if anyone actually tried any of those spots. I met Laddie, Maui Tim, Dusty, Garrett, and Andrew at Makua, but it seemed a bit too brisk, and a bit too cross from the south. Instead, we continued to the end of the paved road, parked our cars, and walked two miles to the point, to see if we could find and use the legendary worst launch on the island. I had the bright idea to bushwhack directly up to launch from the road below, as opposed to walking a bit further along the road to use the actual trail that winds up the nose of the point. It turned out to be a mistake: after the initial grassy slope, I found myself climbing a super steep, crumbly rock face, infested with kiawe, and I went too far to go back down. Nor was there any exit from the sides. I had to keep going up til I crested the ridge, and then hike back around and down to the launch. By the time I got up there my legs were a bloody mess. But I was soon distracted from my pain by the sight of albatrosses wheeling all around the ridge. Man those guys can fly. About that launch. This is the same spot we’ve launched from a couple times before, a little shelf halfway up the ridge line, but it just doesn’t get any good airflow at all. We need to either find a better spot along that ridge, or clean this one up to get better air. I mean, I like a good ninja launch as well as anyone, but not every time! I launched first, with tons of help and after many attempts. Not quite a ninja launch. I hope someone got it on video, but it sure wasn’t pretty. I probably convinced a few people to hike down. Laddie tried next, and struggled mightily to get out of there, but finally gave up. Then Dusty gave it a shot, launching to scratch a long extended sledder almost down to the paved road where we’d left the cars. The last to try was Andrew, aka Flash. By this time a massive anvil cloud had marched across the Kauai Channel and was looming ominously close. He figured he’d launch and just head straight for the cars. He soon joined me above the cars and we agreed that it looked like we still had some time. 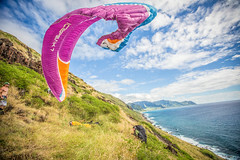 We benched up and soared all over the ridges from the point to the shoulder of Makua. Finally we blazed out to cross Makua Valley, but when we got there the flow was offshore and we were pushed to the beach just past the cave. That was some strange air flowing offshore! Thanks to Dusty for driving my truck to our landing spot. Makua Valley is being used for some kind of Army exercise right now, involving lots of tents, vehicles and helicopters. Lots and lots of helicopters. We saw little birds, blackhawks, and chinooks coming in and out of there all day. Maybe it’s just as well we weren’t launching Makua today. We went to Spicy House to celebrate the day’s adventures. Thanks to Andrew and Becky for covering my dinner. I did buy beer for everyone; I figured it was the least I could do to make up for dragging them to the end of the world. Also thanks to Andrew for sharing a few shots he took from launch. I'm using one for the cover shot here. Conditions look similar tomorrow, maybe a bit wetter in the morning, and maybe a bit more due west, so Makua could possibly work. I hope to see a few more pilots out there.